Jim Nagahiro was born in 1932 in Honolulu, Hawaii. He enlisted in the U.S. Air Force on March 25, 1953, and completed basic training at Parks AFB, California, in May 1953. After completing Pre-Flight Training from May to August 1953, he entered the Aviation Cadet Program for Observer Navigator Training, earning his navigator wings at Harlingen AFB, Texas, on June 16, 1954. Lt Nagahiro served as a C-124 Globemaster II Navigator with the 61st Troop Carrier Group at Donaldson AFB, South Carolina, from June 1954 to June 1956, and then completed flight training, earning his pilot wings at Laredo AFB, Texas, in July 1957. He then completed B-47 Stratojet transition training in November 1957, followed by service as a B-47 pilot at Schilling AFB, Kansas, from November 1957 to August 1961. His next assignment was as a B-47 pilot with the 529th Bomb Squadron at Plattsburgh AFB, New York, from August 1961 to May 1965, and he then completed B-52 Stratofortress Combat Crew Training from May to August 1965. 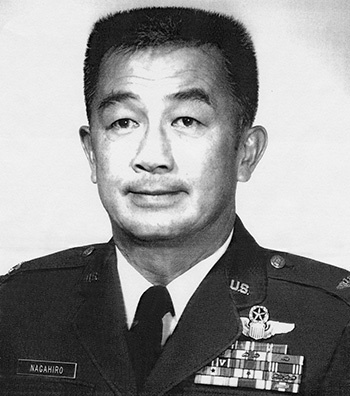 Maj Nagahiro served as a B-52 pilot with the 744th Bomb Squadron at Beale AFB, California, from August 1965 to January 1968, followed by service as an Air Operations Officer, and then Chief of the Scheduling Plans Section of the 456th Strategic Aerospace Wing at Beale from January to December 1968. His next assignment was as an Air Operations Officer and Operations Staff Officer with the 4258th Strategic Wing at U-Tapao Royal Thai AFB, Thailand, from December 1968 to January 1970, and then as a B-52 pilot, Operations Officer, and Flight Examiner with the 60th Bomb Squadron at Ramey AFB, Puerto Rico, from January 1970 to August 1971. LtCol Nagahiro then served as B-52 pilot and Instructor Pilot with the 325th Bomb Squadron at Fairchild AFB, Washington, from August 1971 until he was forced to eject over North Vietnam and was taken as a Prisoner of War on December 21, 1972. After spending 99 days in captivity, he was released during Operation Homecoming on March 29, 1973. He was briefly hospitalized to recover from his injuries at Travis AFB, California, and then received an Air Force Institute of Technology assignment to complete his bachelor's degree at Gonzaga University in Spokane, Washington, from September 1973 to July 1976. His next assignment was as Chief of the Commodities Division at Warner Robins Air Logistics Center, Robins AFB, Georgia, from July 1976 to May 1979, followed by service as Chief of the Commodities Division in the Directorate of Contracting and Manufacturing with the Sacramento Air Logistics Center at McClellan AFB, California, from June 1979 until his retirement from the Air Force on December 1, 1982. Lieutenant Colonel James Y. Nagahiro distinguished himself by heroism while participating in aerial flight as a B-52 Aircraft Commander near Hanoi, North Vietnam, on 20 December 1972. On that date, Colonel Nagahiro and his crew led a strike force of B-52 aircraft against a vital military target located within one of the most highly-defended areas in Southeast Asia. Despite the awesome reaction encountered, which ultimately hit and brought down the aircraft, Colonel Nagahiro displayed uncommon courage, leadership, and heroism by insuring his force struck the objective with devastating results. The outstanding heroism and selfless devotion to duty displayed by Colonel Nagahiro reflect great credit upon himself and the United States Air Force.